Article first published as Warm Lentil & Pasta Soup with Pancetta on Blogcritics. Sauté pancetta in heavy large pot over medium-high heat until crisp and brown. Using slotted spoon, transfer to paper towels to drain (do not clean pot). Spoon 1 tablespoon drippings into medium skillet and reserve. Add celery, onion, carrot, bacon, garlic, bay leaves, and thyme to remaining drippings in pot and sauté until vegetables are soft, about 8 minutes. Add lentils and stir 1 minute. Add 10 cups broth; bring to simmer. Reduce heat to medium-low and simmer uncovered until lentils are soft, about 1 hour. Discard bay leaves and garlic. Using slotted spoon, transfer 2 cups lentils to small bowl; cover and reserve. Working in batches, puree remaining soup until almost smooth. Return to pot. Add cream and vinegar. Thin with more broth to desired consistency. Season with salt and pepper. 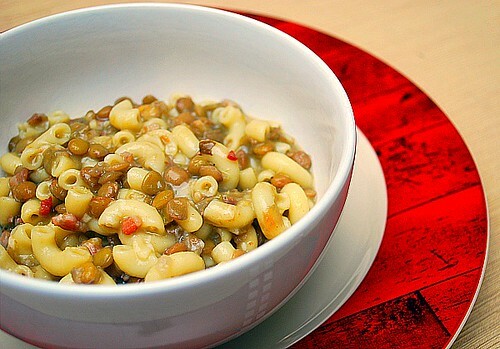 It looks really good, never had lentils with pasta! I'll give it a try!